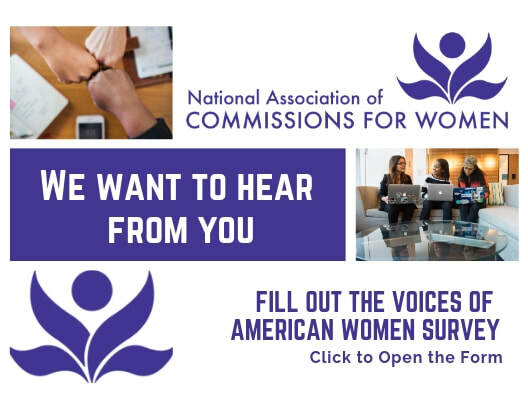 The National Association of Commissions for Women NACW) has launched a listening project across the United States! We are asking all commissions for women (CFW)/commission on the status of women (CSW) to join us as the venue for the voices of women in your community. We ask that you hold public forums inviting women of your communities to talk to you, and thereby “talk to us” about the issues they confront as women in their everyday lives. The listening tour in your city, county or state can take several forms. It can be conducted as public town-hall styled forums, as a survey, or as a focused discussion among your own commissioners. However you choose, we hope you will ensure that the voices of women in your jurisdiction are included in the Voices of American Women project. Join us! The goal of the Voices of American Women project is to provide a venue for women’s voices, across the nation. The outcome will be a report delivered to the President, Congress and the nation outlining what the women of our country have told us are their concerns as women. Each CSW that participates can also develop its own report to its own appointing authorities outlining what the women of that community have said. A secondary outcome of the project can be a guiding agenda for your own Commission – with documentation that this is what the women of your community say they want and need. We ask that Commissions who are participating to conduct heir community-level projects between now and the end of 2019. You then should submit your final report and data to NACW by December 31, 2019. Then, NACW will collate all reports and data into a national report and publish it in 2020 in time for the 100th Anniversary of the Nineteenth Amendment. If you are participating in the Voices project, click here to access resources and templates for the project. If you haven't logged in as a member/participant, click here to gain access to the members-only section. Public forums/town-hall styled meetings: Women in the community are invited to “talk to us” about their needs and concerns as women. The Project will provide you an agenda you can use to solicit their input and structure a 2-hour open forum that includes time for “testimony,” prioritizing the issues presented and briefly discussing possible remedies for the top five issues identified. You can choose to hold one forum or a series of forums around your state, county or city. Depending on your resources, skills and preferences, these forums may be held in person or online. We will even provide a template for the report of the forum(s) and a template for combining the information, if you conduct more than one. You can literally just fill in the blanks, and edit as you choose. Conduct a survey: Whether on-line or in paper format, we can provide you a questionnaire you can use to invite the women of your community to tell you about the issues they find most important. You can use Survey Monkey or similar online survey application to collect and analyze the data so that you can develop the report from your city, county or state. Structured Conversations with Commissioners: One of the most valuable resources each commission has is their own commissioners. Scheduling a structured conversation with them requires far less planning and fewer resources that traveling around your jurisdiction conducting a listening tour. Yet, because your commissioners were appointed to represent the women in their community, they have significant and valuable input to contribute to this project. NACW can provide a format for such a structured conversation and a template for the report out. Take part in our Voices of American Women survey to tell us about the issues your find most important! The data we collect and analyze will be incorporated in our national report due out in 2020. Information will be shared with women's commissions in your area to help them provide more comprehensive programs and services to you. Click here to access the survey. Add us to the list! There's still time! You can add your name to the list of participants in the Voices of American Women project!